Master key concepts. Answer challenging questions. Prepare for exams. Learn at your own pace. Are viruses living? How does photosynthesis occur? Is cloning a form of sexual or asexual reproduction? What is Anton van Leeuwenhoek known for? 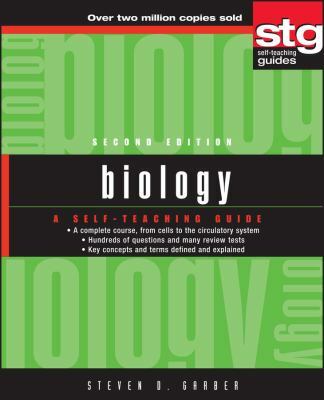 With Biology: A Self-Teaching Guide, Second Edition, you'll discover the answers to these questions and many more. Steven Garber explains all the major biological concepts and terms in this newly revised edition, including the origin of life, evolution, cell biology, reproduction, physiology, and botany. The step-by-step, clearly structured format of Biology makes it fully accessible to all levels of students, providing an easily understood, comprehensive treatment of all aspects of life science. Like all Self-Teaching Guides, Biology allows you to build gradually on what you have learned-at your own pace. Questions and self-tests reinforce the information in each chapter and allow you to skip ahead or focus on specific areas of concern. Packed with useful, up-to-date information, this clear, concise volume is a valuable learning tool and reference source for anyone who needs to master the science of life.